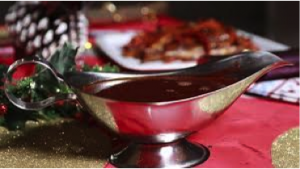 You can make this delicious Jamie Oliver gravy a few days (or even weeks) before Christmas, then finish it on Christmas Day. 1. Preheat the oven to 200ºC/400ºF/gas 6. Put the veg, herbs and star anise into a sturdy bottomed roasting tray. Scatter the bacon on top. 2. Break the chicken wings open then put them onto a board and bash the bones up with the end of a rolling pin; this will release more of their flavor. Put them in the pan, drizzle with olive oil, sprinkle over a few pinches of salt and pepper then toss everything together and put the tray in the oven to cook for 1 hour, or until the meat is tender and falling off the bone. 3. Take the pan out of the oven, and put it on a hob over a low heat and use a potato masher to really grind and mash everything up. Keep mashing, moving and scraping all the goodness from the bottom of the pan as you go. Gradually mix in the flour to thicken the mixture. The longer you let everything fry, the darker your gravy will be. When the flour is combined pour in 2 liters of hot water, turn the heat up and bring to the boil for 10 minutes, till thickened, then turn down the heat and simmer for about 25 minutes, stirring occasionally. If you want to add 60ml sherry or port for flavour, do that now. 4. When it’s reached the consistency you’re looking for, check the seasoning then push it through a sieve into a large bowl. Really push and mash everything through so you get as much flavor as possible. Discard anything left behind. Once it has cooled down to room temperature put it into containers or freezer bags and pop it in your freezer. You’ll finish it off on Christmas Day. 5. To finish the gravy, take it out of the freezer when you’re ready to cook your turkey. That way, it will defrost as your turkey cooks. When the turkey is perfectly cooked, put a carving fork inside the cavity and use that to pick the bird up and tilt it over the pan so all of the juices inside run out. 6. Spoon away as much of the fat as possible, then pour your pre-made gravy into the pan with the rest of the turkey juices. Bring it to the boil over the hob and scrape all those flavorful bits and pieces from the bottom of the pan. Have a taste then add the cranberry sauce. It won’t taste sweet but it will add a wicked background flavour. 7. Once your gravy is piping hot, strain it through a sieve and into a pan. Leave that on the lowest heat to tick away until you’re ready to serve. Skim away any fat that rises to the top and add any extra resting juices from the turkey before serving. online prescriptions without a doctor http://cialisvi.com/ Really quite a lot of fantastic material! Viagra vs viagra vs levitra http://mulbvepers.strikingly.com/ Fantastic stuff, With thanks. no 1 canadian pharcharmy online http://xn----7sbaaihi7aauthh0bes4a5e.xn--p1ai/component/k2/itemlist/user/54208 You actually said this really well. pharmacy canada http://elirrineck.strikingly.com/ Wow a good deal of good knowledge! canadian discount pharmacies http://feraneders.strikingly.com/ Valuable tips. Many thanks! cialis 20mg http://cialisonli.com/ You definitely made the point. viagra vs cialis Cheers. I enjoy this! cialis without a doctor's prescription http://cialisonla.com/ Wow tons of wonderful knowledge! cialis lowest price http://kawanboni.com/ Nicely put. Cheers! generic for cialis http://cialisiv.com/ Amazing a lot of helpful tips! cialis lowest price http://cialisky.com/ Perfectly expressed without a doubt. ! essay for me http://gsgfsdgfdhjhjhj.com/ You said it perfectly. !